Food has a very interesting and important place in my heart. My major liking on a place often relies on the food of the place. While traveling and exploring new places, food memories stay with me quite well. Madrid is one of the places with so many factors to love about, food being certainly one of them. I am in Love with it forever and surely inspires me to come back pretty soon. 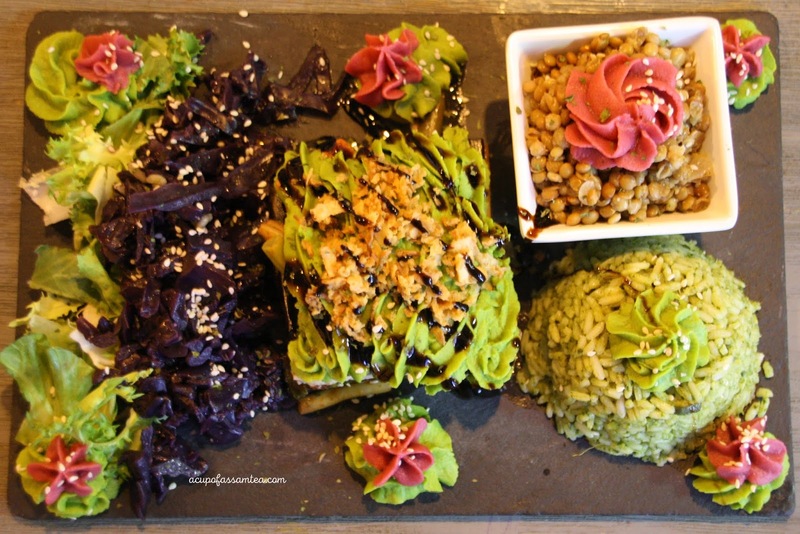 I can’t believe how many healthy or vegan restaurant options Madrid has. 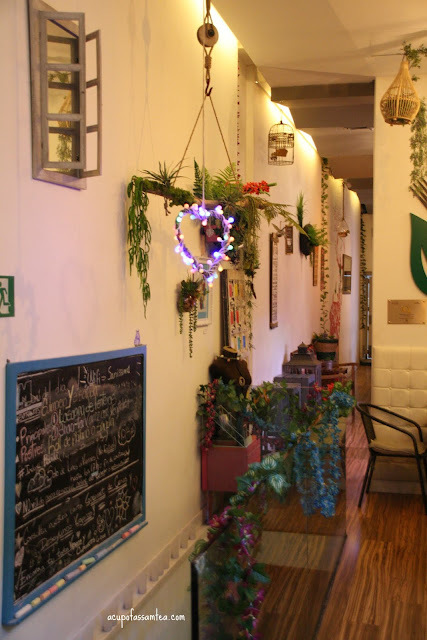 One of our beautiful evenings in Madrid, we stumbled upon a vegan and vegetarian place called Sanissimo. Beautiful wall paintings, bird cases and lovely decor make this cozy place an inviting one. The Greek and Spanish inspired menu has so many options to chose from. For our starter, we had spinach and ricotta pastry and beetroot hummus with focaccia bread. 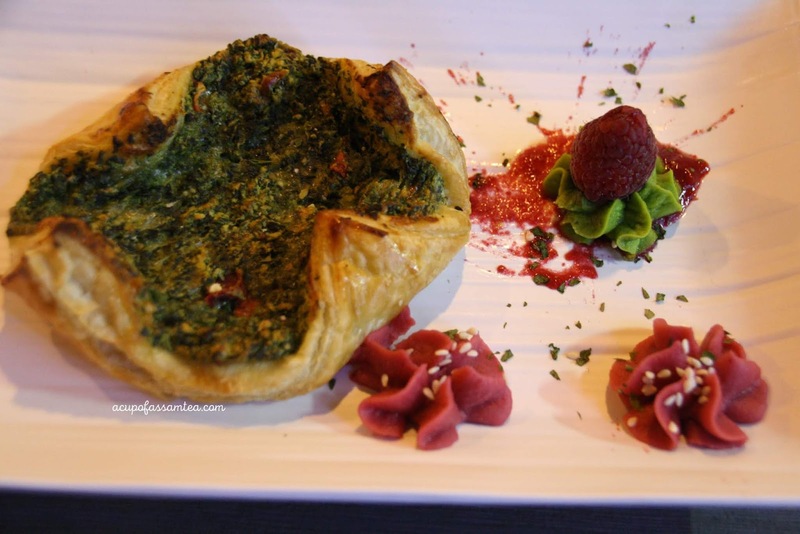 I love the crunchy base on the Riccota cheese pastry and spinach goes so well with it. Love the facaddia bread with olives and hummus. Flowery hummus and bread presentation definitely create a lovely culinary aesthetic. As much as I love the bread, I wish I got the same punch and flavor in the hummus. It was a little blend. For the mains I got eggplant lasagna, it was succulent lasagna and at the same time, they were able to retain the natural flavor. Also, it came with Mexican green rice and a little bowl of red savory lentils, that perfectly balance the distinctive lasagna. Then my husband got chickpeas to wrap. A delicate, warm wrap with veggies was very filling and delicious. But, if you are in favor of flavorful food you might find it little blend. Nevertheless the less we ended the day without dessert as it was quite generous when it comes to portion. A quick and attentive service with culinary aesthetics will remain one of my favorite part of Madrid memory. Your piece certainly makes me want to try all this interesting food ., looks so delicious .. looking forward to more posts from your Spanish sojourn!